Dried fruit soup, known as “Søtsuppe” or “Sweet Soup” is a Norwegian favorite. Here’s a basic recipe – feel free to experiment with the types of fruit according to your taste and the ingredients you have on hand. The trick is to simmer the soup slowly to retain the shapes of the fruit. If most of the liquid were cooked out, this would be known as a fruit compote. Cookie floaters lend an extra sparkle to Norwegian fruit soups and compotes. This entry was posted in Apples, Apricots, Cinnamon, Desserts, Dried fruit, Norwegian, Prunes, Raisins, Recipe collections, Recipes, Soups, Star anise, Tapioca, Traditional recipes and tagged Desserter, Dessertoppskrifter, Dessertsupper, Fruktsupper, Gammeldagse oppskrifter, Matblogg, Oppskriftblogg, Oppskrifter med tørket frukt, Søte supper, Suppeoppskrifter. I was surprised when I saw the recipe. 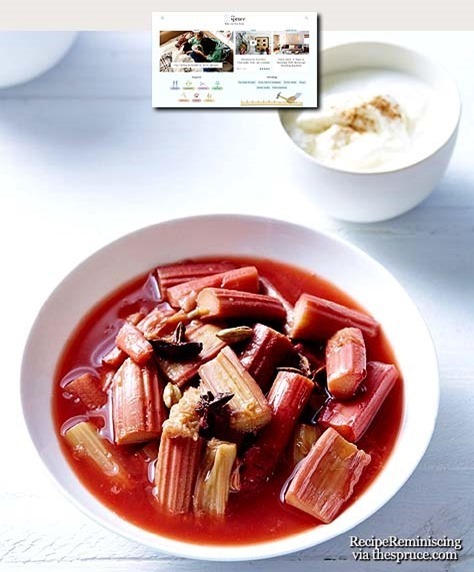 I thought it was rhubarb in the bowl.